Everyone seems to complain that the plot in this film is too confusing, but just because you don't 'get' it doesn't mean it's a bad movie. I thought that the plot was superb; it may be a little difficult to follow, but with a little thought it isn't at all hard to understand. It is refreshing to have a big budget thriller with a clever plot, not just masses of pyrotechnics and gunplay. The filmmakers delivered the film on time and under budget with Tom Cruise doing most of his own stunts. Ethan Hunt: So, how does it feel to be a solid citizen again? Luther Stickell: Man, I don't know. I'm gonna miss bein' disreputable. Ethan Hunt: Well, Luther, if it makes you feel any better, I'll always think of you that way. Although some would consider a computer room equipped with the three high-tech security systems, meant to prevent any intrusion, as missing the "most basic security measure" of video surveillance, video surveillance is often not permitted in highly classified areas where there is a risk that unauthorized personnel - such as the security personnel - may see the material. The security personnel may theoretically be cleared for that classification but they would not have a "need to know" the information contained within AND video surveillance visible in another area would defy the measures taken to keep the information in a secure room. However, a simple device to lock out the keyboard, of any other I/O devices or ports, when there was no authorised operator officially present, would be simple to implement, very efficient, and pose zero potential for information leakage. The opening credits contain several plot points from the movie. 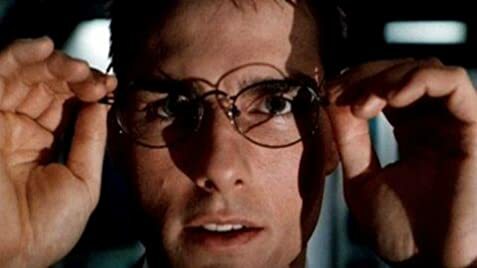 The in-joke where Tom Cruise goes online with his laptop by typing in, not Usenet, but Crusenet, has been changed in the US DVD versions to where he types "internet access." Courtesy of Island Records, Ltd.